A powerful mint with a pleasant taste can be difficult to find. Too much “minty-ness” will leave a mouth burning – a sensation I seldom welcome in general. Particularly, I have this problem with peppermint mints. I like the peppermint, but it’s almost too much of a good thing. I also don’t like Big Red gum or Atomic Fireballs for this same reason. It’s like there’s no middle ground with mints. You either get super-minty-burn or a lackluster, vague mint flavor. Psshh, I don’t want that! I’m not particularly fond of mints in general because I can’t find that happy balance. Or so I thought. 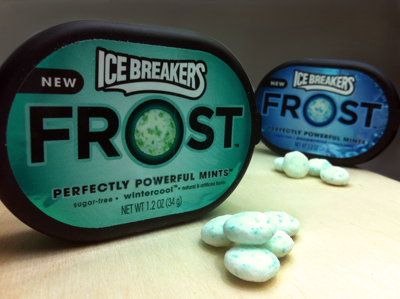 Yes, that’s right, I found the mint-of-my-life… Ice Breakers Frost mints! These fresh wonders come in peppermint and wintercool (derived from the notorious winteres coolica plant, I assume) varieties and are like a cool, winter’s kiss. Seriously, they totally mitigate the super minty burn I was just talking about. I actually prefer the peppermint – which pretty much never happens. There isn’t any strange aftertaste, no burning sensation, no double-vision, runny nose, or excessive salivation. It’s the perfect mint. Oh, and it’s flavor crystals really add a splash of color – some bling, if you will. I know it’s early in our courtship, Ice Breaker Frost mints. We’ve only just met, but all the same… I love you. Was it too soon to say?! 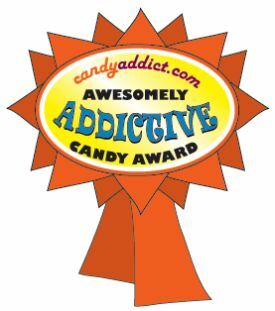 I’ll shout it to the world… You’re Awesomely Addictive!